It's almost that time of year again, when families gather for the festive season and indulge in some good cheer, good food, and perhaps some good ol' bickering too (well..hopefully less of the latter). If you're the only vegan in your household - like moi - then chances are that you're already racking your brain as to how to navigate or contribute to the dinner table come December 25. On the one hand, you don't want to be a burden and put on the family member(s) in charge of the meal that day. On the other, you don't want to be left with a sad looking plate of side-dishes-turned-main-meal while everyone else chows down on fully loaded plates. To avoid any of that awkwardness (especially if you're not the one doing the meal planning), you'd do well to come prepared. OR, if you have the will, time and stellar skills of persuasion, you can offer to take over completely and get your family to try an exclusively vegan Christmas meal this year. In which case, you'll need something totally amazing to knock their socks off. This is where Fry's Country Roast comes in. If you read my last post on their Rice Protein & Chia Nuggets, you'd have seen how enamoured I was with that product. Consequently, I had very high expectations of this particular one, and I was not disappointed. 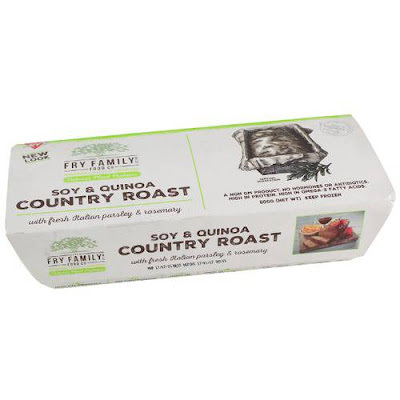 The Soy & Quinoa Country Roast (500g) easily serves up to 4 people and so I had the pleasure of sharing it with a couple of friends who also weighed in with positive comments about the taste, although one did voice - and I agreed - that she would have liked to see even more quinoa in the product. The roast, which comes in a handy rectangular, oven-proof foil tray, took about 30 minutes to cook at gas mark 4. It sliced well, held its shape completely and had a crisp finish on the outside. It was packed full of flavour (it contains a generous selection of herbs such as parsley, coriander, rosemary, basil, marjoram, oregano, sage and thyme) and stood well with a serving of maple-roasted mixed vegetables. With more time, I would have liked to have served it with a nice vegetable gravy, but even without that, the roast was delicious and succulent. According to the cooking instructions, the roast can also be steamed in the foil packet, which I imagine would make it even softer and more succulent if that's your desired result. Now on to some health and nutrition info. As well as being high in protein and omega 3 fatty acids (flaxseed oil is listed as one of the ingredients), the roast is also a non GM product and contains no antibiotics, so you can feel safe and confident about serving this to your family. Fry's Country Roast is available to buy online and at Morrison's stores across the UK. For a full list of stockists, visit their official website for more information. Note: Thanks to the Vegan Lifestyle Association for the opportunity to carry out this review. Lovely review, thanks for taking the time to review our product! :) We will make sure all the feedback is given to Hayley Fry the head of technical and you never know what changes may be made! Sadly for the Fry family we don't get it in Australia... so we will have to wait until next Christmas!